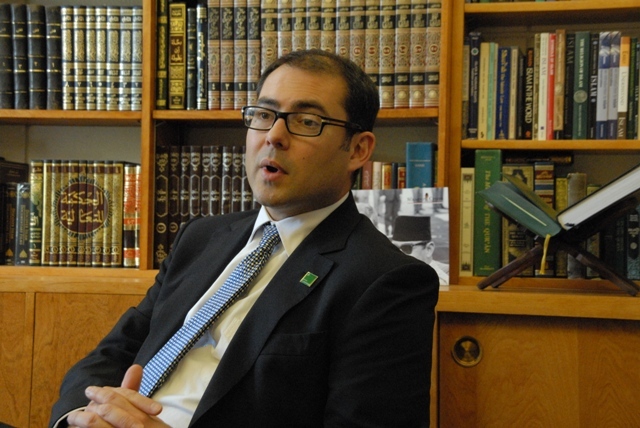 We sat down with Dr. Jihad Turk to learn about the Bayan Claremont and the routes of Interreligious dialogue in Islam. 1. Q: What is Bayan Claremont? A: Bayan Claremont is the first Islamic Seminary in the United States. It is an Islamic Graduate School offering accredited Master’s Degrees. First Master’s Degree we’re offering is in Islamic studies and Leadership and the goal for this degree is to prepare the leaders of tomorrow serving as Imams, as youth directors and heads of non-profits for the Muslim community. Also, to go onto academia to serve as Professors and Scholars as well. Our institution is designed to be the first Islamic Graduate School in the United States that is not only academic but also prepares leaders to lead the community into a position of excellence and to help guide our communities in ways that will help them be more successful in integrating and contributing to the society in which we live. 2. Q: When and how was Bayan Claremont established? A: It’s an interesting story. I was an academic by education myself and I was in Islamic studies and I came out to UCLA to do my Doctorate in Islamic Studies and while I was doing my degree there and teaching as wells as an adjunct faculty, I was recruited by the Islamic Center of California as the Imam or Religious Director. I was also involved in inter-faith work as well as academia and Islamic leadership. I was co-teaching a class at USC with a Rabbi on the Quran and the Hebrew Bible. One of my students was doing her Masters in Chaplaincy here at Claremont School of Theology a number of years ago and they had recently brought a new President on to the school here who had developed a wonderful vision to create a consortium of Graduate Seminaries so that the next generation of religious leaders would learn how to cooperate with one another. He was inquiring with her about seminaries and she had referred President Jerry Campbell to me. He invited me to speak at the Commencement ceremony for The Christian seminary here. And we got to know each other, and he shared with me his vision and inquired about accredited Islamic Graduate Schools or seminaries in the United States and his vision of partnering with one to form this consortium. It sounded like a brilliant idea but an Islamic Graduate Seminary that’s accredited in the United States did not exist at the time. But we needed one. I suggested the institution in which I was serving as a Religious Director. I think it being the oldest, and largest Islamic Center in Los Angeles and Southern California, it would it would be the best institution to help create one. He said; to let him know if interested and that they could probably help out with some funding. But mostly through incubating the institution so that the programs would be accredited. Once the Islamic Center decided to move forward, we formed an inter-faith university, called Claremont Lincoln University and received some donation from a Christian donor, David Lincoln and his wife Joan. As a token of how serious Jerry Campbell was in making it a partnership of equals, he invited myself and Dr. Meyer to be board members. The head of the Jewish Center that we were partnering with and the chair of his board as well to be the two Jewish representatives and Jerry Campbell and the donor, David Lincoln were the two Christian representatives. And we founded this Claremont Lincoln University to serve as the hub of this consortium of seminaries. The Academy for Jewish religion being the Jewish partner, Claremont School of Theology a very historic and well regarded Christian seminary as a Christian seminary partner. And Bayan Claremont as the Muslim partner. And so we launched about 3 years ago in 2010, took on our first students in 2011 and graduated our first students 2013. We’re growing slowly and surely and we’re bringing on some top-notch faculty from around the country to serve as visiting faculty and we’re expanding our programming and growing our faculty and our programming as well. It’s been wonderful to be a part of a consortium because our students that graduate from here, learn to gain solid foundation of academic study in Islam, traditional scholarship and spiritual education in Islam. Our students become firmly grounded on civic engagement and on inter-faith collaboration and cooperation. It’s really a unique kind of degree. We’re pioneering in this field and it’s very exciting to be working on filling the need that exists in our community. 3. Q: As you know interfaith dialog has been a part of Islam ever since the time of Prophet Muhammad? Can you talk about some of his inter religious activities? A: I would say that what we do here at Bayan in terms of our inter-faith orientation is inspired by the leadership of the Prophet Mohammed and the Commandments in the Quran. Students here learn to engage in getting to know one another across different lines of ethnic and religious divisions and to cooperate with one another for the greater good. There’s a famous verse in translation reads “Oh mankind, we are created you from a single male and a single female and made you into nations and tribes so that you may get to know one another not that you may despise one another. The best of you in the sight of God is the one most God consciousness.” In other words; cooperate for the common good in doing good deeds. And we see that the Prophet Mohammed peace be upon him, in his lifetime invited visitors who were from like the Christian tradition to come into the mosque. He hosted them. The Quran also is for a religion that teaches as an exclusive truth claim, mainly that God is one, that Mohammed is a prophet. All of these are very specific theological claims. None the less, it leaves open the possibility that God ultimately will judge each person individually, based on how they reacted to the circumstances in which He put them. And so, salvation in other words is not exclusively for Muslims based on the teachings of the Quran. For example, in chapter 2 verse 62 in which God says; Verily those who believe, the Christians, Jews who so ever believes in God in the day of judgment and does good deeds will have their reward with their Lord. They shall not fear for their soul no shall they grieve. It leaves open tremendous possibility that God ultimately will judge each person individually and decide their fate and it’s not our job to do so. But what is our job? It’s to cooperate for the common good. So, we’re very committed and inspired by the teachings of the Prophet and by the Quran in engaging in inter-faith cooperation.